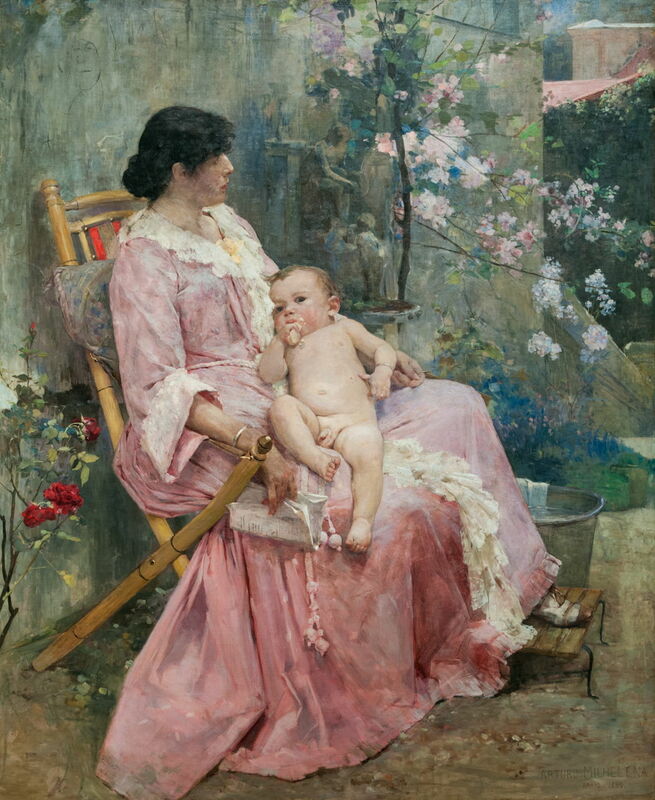 Arturo Michelena (1863–1898), Young Mother (1889), oil on canvas, 172 x 141.8 cm, Galería de Arte Nacional, Caracas, Venezuela. Wikimedia Commons. Try naming just one South American painter and most of us would draw a blank. Yet in the late 1800s, the eclectic Académie Julian trained artists from all over the world, including Francisco Arturo Michelena Castillo (1863-1898), who became the first Venezuelan painter to receive overseas acclaim. Arturo Michelena was born in Valencia – not in Spain, but in Venezuela. He learned to paint first under his father, and quickly showed great aptitude. He travelled to Paris, to study at the Académie Julian under the history painter and great teacher, Jean-Paul Laurens. 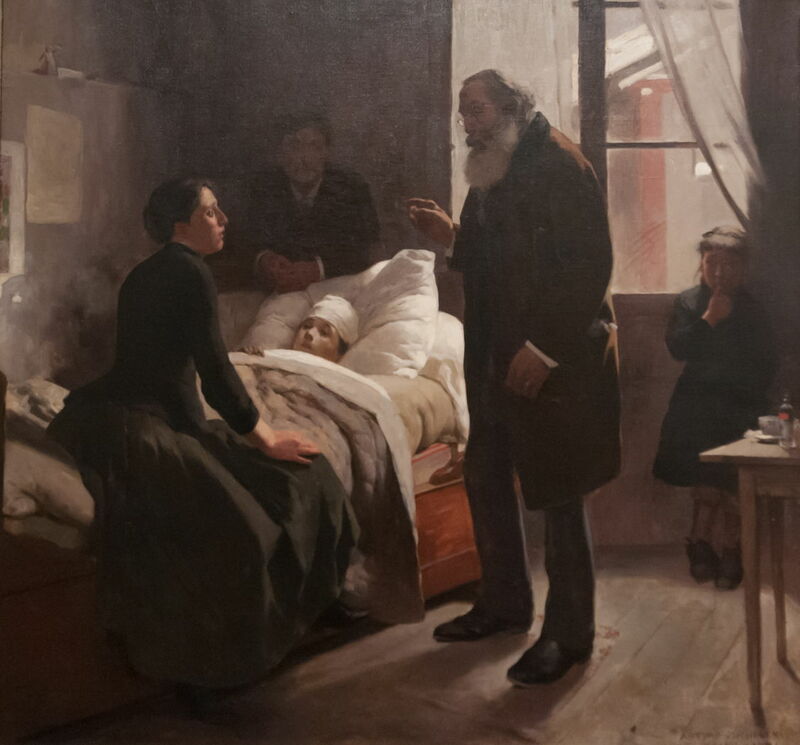 In 1886 (or 1887), his painting of The Sick Child (1886) was awarded a gold medal at the Paris Salon, and was purchased by the Astor family of New York. Michelena returned to Venezuela, where he concentrated on portraiture and depicting major scenes in the national history of the country. He died at the age of only 35 in Caracas in 1898. His works are held in high esteem in Venezuela in particular, where the National Gallery in Caracas has a major collection of them. He is generally regarded as one of the founding fathers of painting in Venezuela, alongside Cristóbal Rojas (1857-1890) and Martín Tovar y Tovar (1827-1902). Unfortunately there are too few good images of their paintings to support separate articles about them. 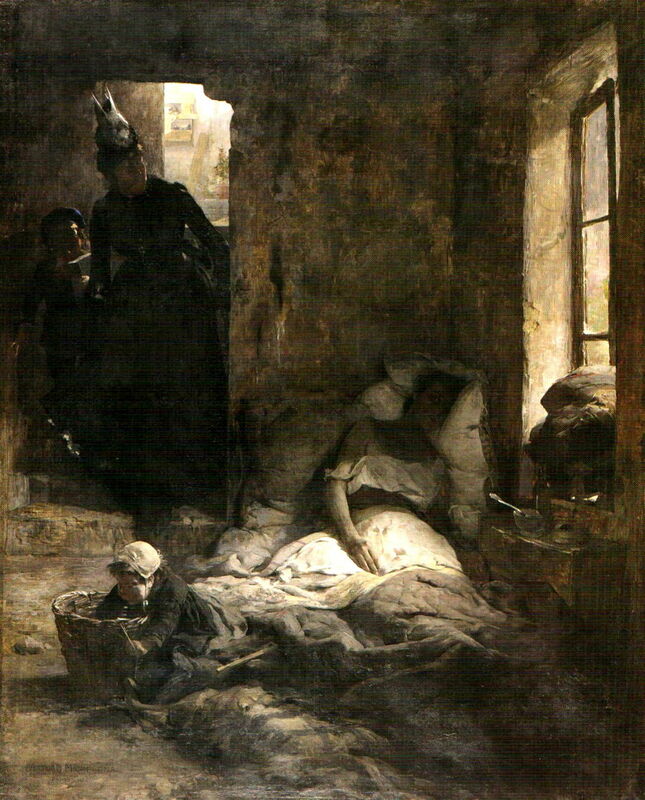 Arturo Michelena (1863–1898), The Sick Child (1886), oil on canvas, 80.4 x 85 cm, Galería de Arte Nacional, Caracas, Venezuela. Wikimedia Commons. The Sick Child (1886) is a classic nineteenth century domestic narrative, brilliantly composed, and painted into the light. A distressed mother sits on her child’s bed, at his feet, staring anxiously at the attending doctor, who is explaining the bad news to her. The father leans, detached, at the head of the bed, and a scared little sister hides behind the curtain. Arturo Michelena (1863–1898), El Granizo de Reims (Hailstorm in Reims) (1886), oil on canvas, 197 x 224 cm, Galería de Arte Nacional, Caracas, Venezuela. Wikimedia Commons. El Granizo de Reims (which I translate as Hailstorm in Reims) (1886) is a more novel domestic narrative with the same theme of urban poverty. 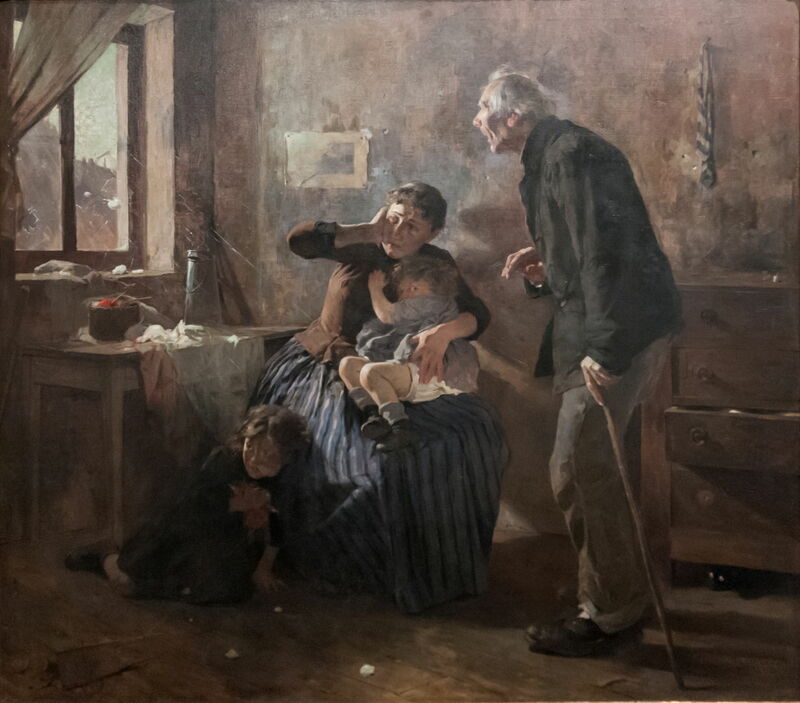 A mother cuddles her toddler on her lap, and an older girl shelters at her feet, as large hailstones shatter the glass of the window, and land on the table beside her. The mother’s elderly father stands, looking out in astonishment. Arturo Michelena (1863–1898), Charity (1888), oil on canvas, 288.8 x 231.7 cm, Galería de Arte Nacional, Caracas, Venezuela. Wikimedia Commons. Charity (1888) continues the theme, as a pair of bourgeois ladies arrive to do their bit for charity, in the hovel which is home to a young mother and her small child. Michelena uses the light very skilfully to pick out sufficient detail in each of the figures to enable the viewer to read the painting. 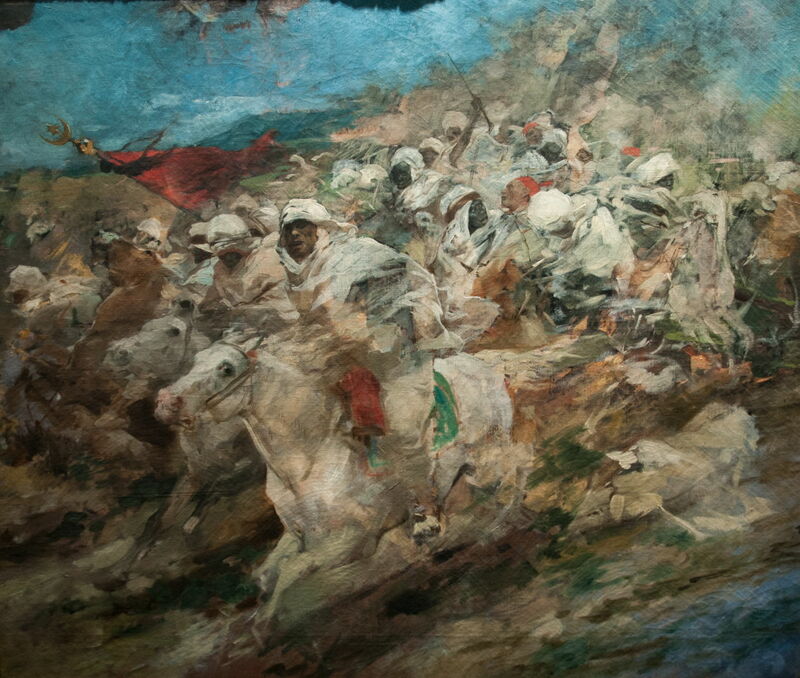 Arturo Michelena (1863–1898), Arabian Fantasy (1889), oil on canvas, 87.4 x 104 cm, Banco Industrial de Venezuela, Caracas, Venezuela. Wikimedia Commons. Arabian Fantasy (1889) is a complete contrast to those earlier static tableaux in earth colours, with a look more of the late Delacroix in the movement, colours, and its wonderful horses, and its very loose brushstrokes. Arturo Michelena (1863–1898), Charlotte Corday (1889), oil on canvas, 234 x 315.5 cm, Galería de Arte Nacional, Caracas, Venezuela. Wikimedia Commons. Charlotte Corday (1889) is superb history painting, of which Michelena’s teacher Laurens must have been proud. 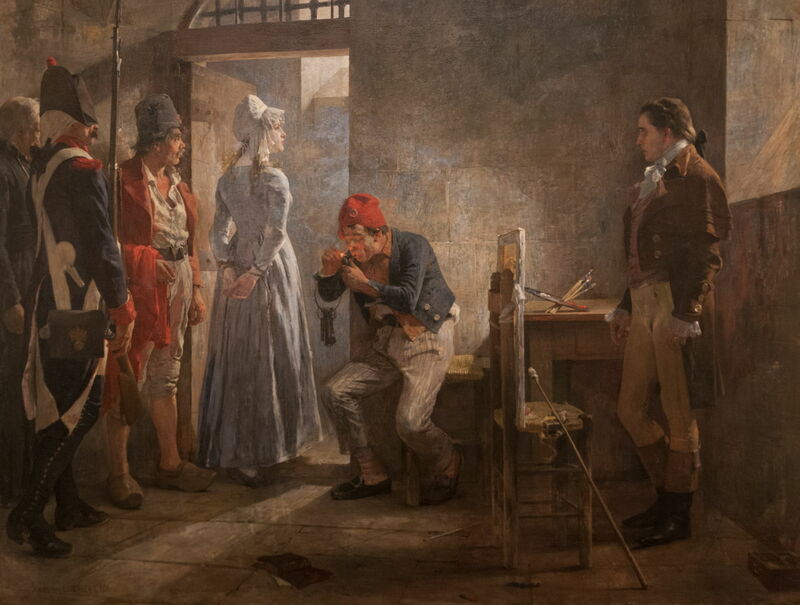 It shows Charlotte Corday (Marie-Ann Charlotte de Corday d’Armont) going to the guillotine on 17 July 1793, after she had murdered the revolutionary politican and leader Jean-Paul Marat. Her full story is told in my account of David’s history painting. Michelena’s composition is again exceptional, with a painter (perhaps David himself) at the right, a jailer preoccupied by lighting his pipe, and an executioner’s assistant right behind her carrying the scarlet overblouse she had to wear to denote that she was deemed a traitor. Once again he uses indirect lighting to great effect. Of all his fine paintings, Michelena’s Young Mother (1889) is probably his best, with its delicate balance between detail and sketchiness. This appears to have been completed shortly before he returned to Venezuela later that year. Arturo Michelena (1863–1898), Crossing the Andes (1889), oil on canvas, 99 x 72 cm, Galería de Arte Nacional, Caracas, Venezuela. Wikimedia Commons. 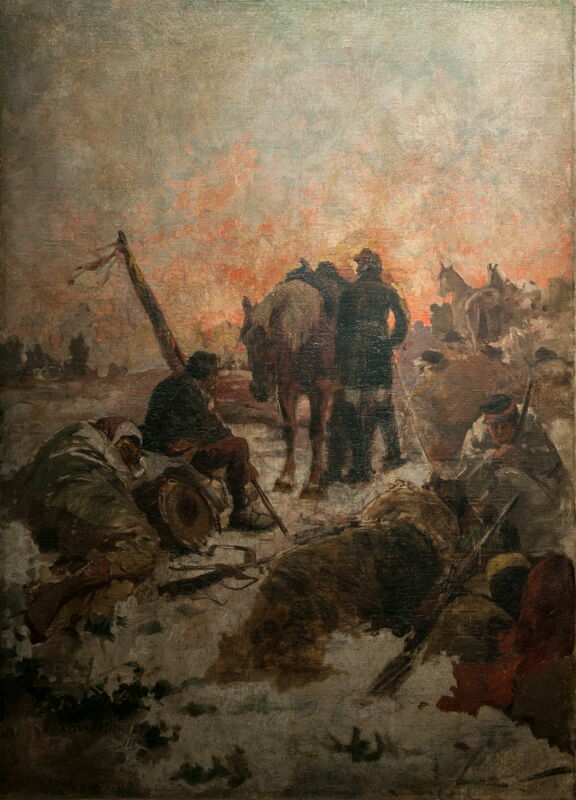 Crossing the Andes (1889) shows the grim reality of an army unit operating at altitude and in bitter conditions in the Andes Mountains. It was perhaps his response to similar paintings which he had seen in Paris, showing the Alpine and winter campaigns of Napoleon. Arturo Michelena (1863–1898), Lastenia Tello de Michelena (1890), oil on canvas, 135.1 x 92 cm, Galería de Arte Nacional, Caracas, Venezuela. Wikimedia Commons. 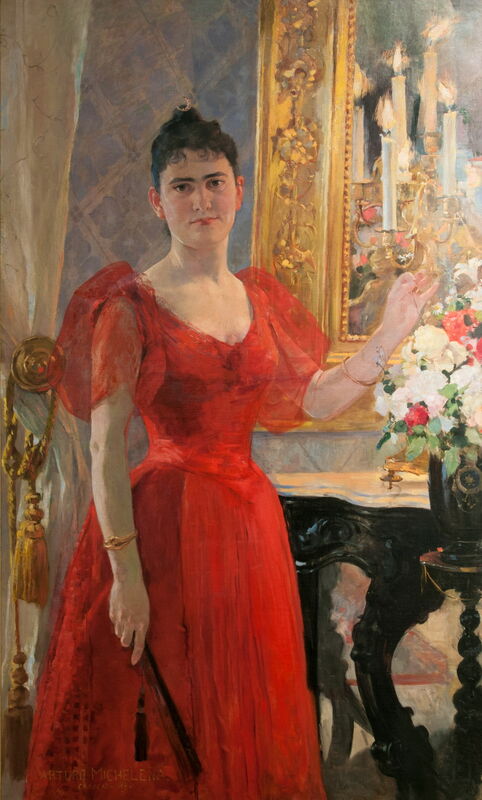 Of his portraits, I think that of Lastenia Tello de Michelena (1890) is among his best, and I think shows his wife, who must have been born in about 1866, and was thus about 24 at the time. He painted her in Caracas. Arturo Michelena (1863–1898), Vuelvan caras (About turn!) 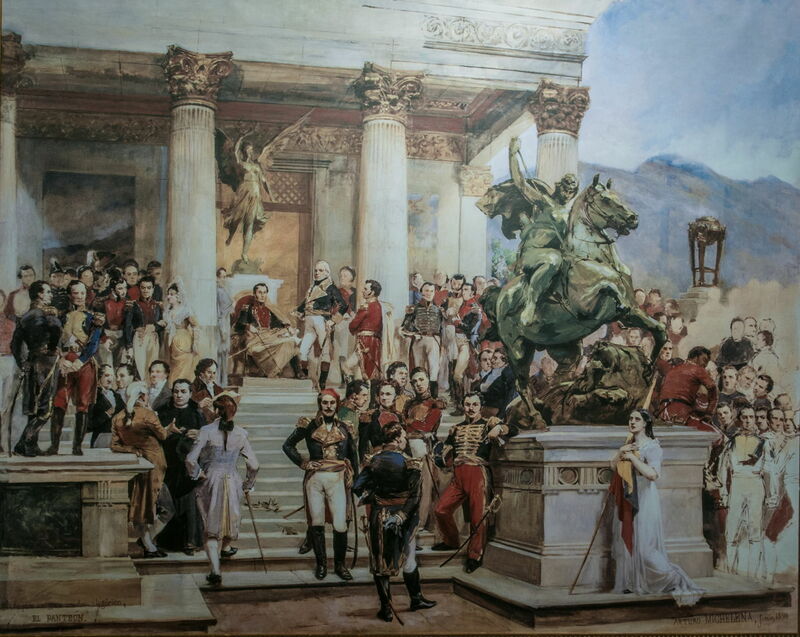 (1890), oil on canvas, 300 x 460 cm, Instituto Autonomo Circulo Militar de las Fuerzas Armadas, Caracas, Venezuela. Wikimedia Commons. Vuelvan caras (About turn!) 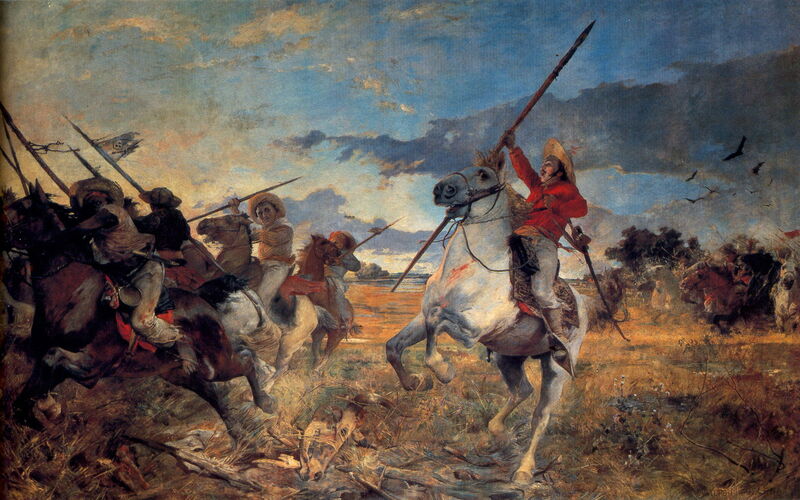 (1890) shows an episode from the Battle of Las Queseras del Medio on 2 April 1819, when General José Antonio Páez ordered his llaneros (lancers) to turn and attack the Spanish cavalry who were pursuing them. Páez was heavily outnumbered, with only 153 llaneros against more than a thousand Spanish cavalry, who were thrown into confusion, panicked, and fled, giving the Venezuelan patriots a surprise victory. The battle was an important step towards the independence of Venezuela. Arturo Michelena (1863–1898), The Death of Sucre in Berruecos (1895), oil on canvas, 120cm x 175.4 cm, Galería de Arte Nacional, Caracas, Venezuela. Wikimedia Commons. The Death of Sucre in Berruecos (1895) shows another important episode from the early history of the Venezuelan state. Antonio José de Sucre y Alcalá was close to Simón Bolívar, a major leader in South American independence, and the second President of Bolivia. 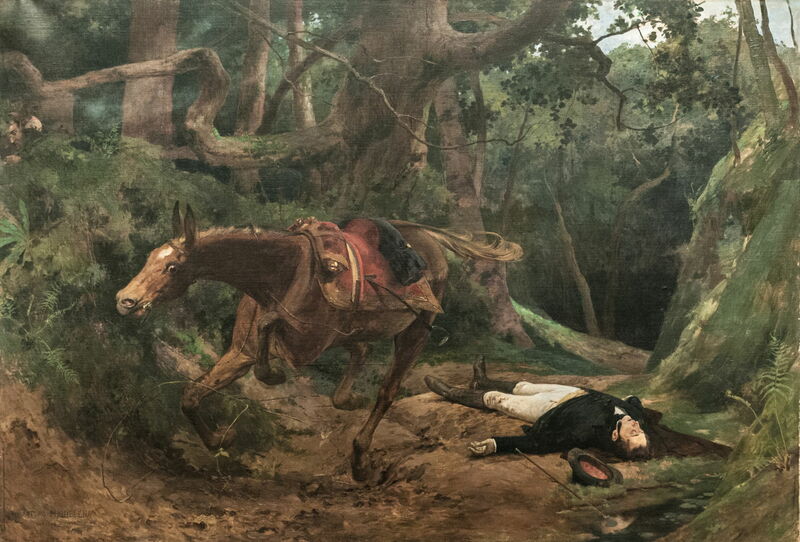 A plot to assassinate Sucre came to fruition on 4 June 1830, and he was ambushed on a trail through bleak forest. In reality, Sucre was riding a mule, from which he fell when he was struck by three bullets; his mule was also shot, in the neck, and died almost instantly. The rest of his party fled in fear, leaving his body for 24 hours where he had fallen. 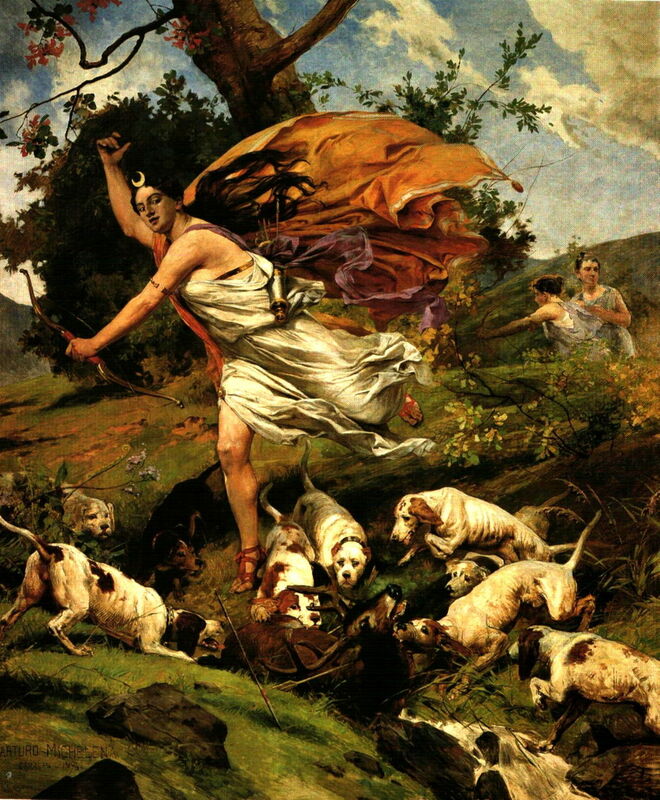 Arturo Michelena (1863–1898), Diana the Huntress (1896), oil on canvas, 351 x 296 cm, Residencia Presidencial La Casona, Caracas, Venezuela. Wikimedia Commons. Michelena never completely abandoned his history painting, producing Diana the Huntress in 1896, a spirited depiction of the classical goddess Diana as huntress. Arturo Michelena (1863–1898), Miranda in La Carraca (1896), oil on canvas, 245.2 x 197 cm, Galería de Arte Nacional, Caracas, Venezuela. Wikimedia Commons. His Miranda in La Carraca (1896) would also have made Laurens proud. It shows the final days, in La Carraca prison, Cadiz, Spain, of Francisco de Miranda. Miranda had been a forerunner of Simón Bolívar, and tried to liberate and unify Spanish America. 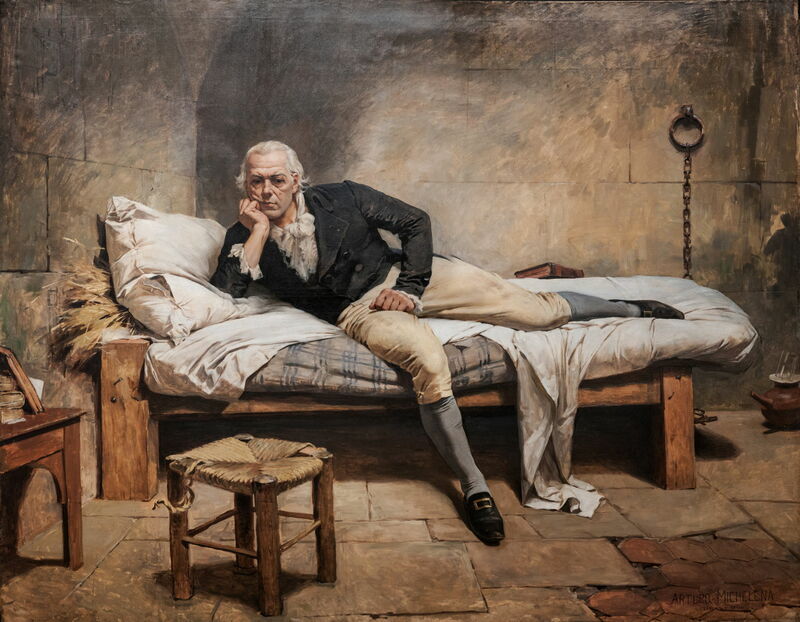 However he was captured in 1812 and handed over to the Spanish authorities, who put him into the notorious prison of La Carraca, where he died on 14 July 1816. Arturo Michelena (1863–1898), The Pantheon of Heroes (1898), oil on canvas, 135 x 168 cm, Private collection. Wikimedia Commons. Those and other figures who were instrumental in the independence of Venezuela are commemorated by Michelena in his The Pantheon of Heroes (1898), completed just a few weeks before his own untimely death. Posted in General, Painting and tagged David, Impressionism, Laurens, Michelena, painting, Venezuela. Bookmark the permalink.